The recent Christianity Today story "Evangelical Leaders Challenge Trump's 'America First' Budget" immediately made me think of three things. "It is compassionate to actively help our citizens in need." "We do not believe in a sink-or-swim society. The policies of our government must heed the universal call of all faiths to love our neighbors as we would want to be loved ourselves." 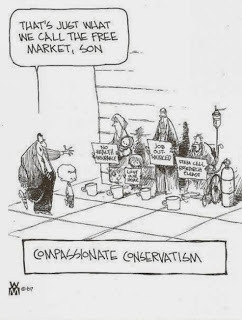 "Compassionate conservatism places great hope and confidence in public education." "It is compassionate to increase our international aid." That was 2002, folks. Even the recent past is a foreign country. Two, the roster of signatories to the letter opposing Trump's budget provides an interesting look at what constitutes "leadership" in American evangelicalism. This is a big question when you're talking about a movement that tends to eschew denominational structures, looks askance at cultural elites, and engages in a constant internal battle about its own boundaries. ("So what is an evangelical, for the love of God, and why does it even matter?" asked Jonathan Merritt in The Atlantic a couple of years ago.) This list of folks that the "evangelical flagship" magazine Christianity Today dubs "evangelical leaders" includes a bunch of Catholics, heads of several parachurch organizations, pastors, a smattering of academics, denominational figures from a pretty wide range of traditions, and several musicians, notably (to this child of the 1980s) Amy Grant and Michael W. Smith. Overall, the list strikes me as a useful window into the institutions and various forms of cultural capital that pertain in the evangelical world--unless these folks aren't actually "leaders" in the sense of having followers. And that's the third thing the article raises in my mind. In my study of American mainline Protestantism, I argued that mainline "leaders" didn't do a great job of communicating their ideas to laypeople, and that the pronouncements of bishops, seminary professors, magazine editors, and the like rarely represented the views of these folks' purported constituencies. I posited higher education as a key cause for this disconnect. Put simply, once you've gone away to college and, later, seminary or grad school, it's hard to go home again. Does this lack of a sharp, categorial divide between clergy and laity mean that evangelical "leaders" will have better luck at attracting followers than did my midcentury mainliners? Or are American religious folks just really, really hard to lead? Of course, there is another possibility: that this list of "leaders" is arbitrary and, well, misleading. After the election, Christianity Today sought responses from "20 Evangelical Leaders," and there's very little overlap between these two lists. There's even less overlap, in names or views, with the folks in Time's article "Evangelical Leaders Celebrate the Day Before Donald Trump's Inauguration." Perhaps there are no true evangelical leaders, or there are so many that none of them has much power, or evangelicalism is headed for a split, or there was never any unified "evangelical" movement anyway. At this point, I genuinely have no idea.